Sat., May 12, 2018, 9:42 a.m.
ASSISI, Italy – German Chancellor Angela Merkel lamented Saturday that U.S. President Donald Trump’s decision to pull his country out of the Iran nuclear accord was making the situation in the Middle East “even more difficult” and warned Europeans to be skeptical of “easy” solutions promised by populists. Speaking while in Italy to receive a peace prize, Merkel cited the recent escalation of Israeli-Iranian hostility that quickly followed Trump’s announcement about the Iran accord as a reason for concern. 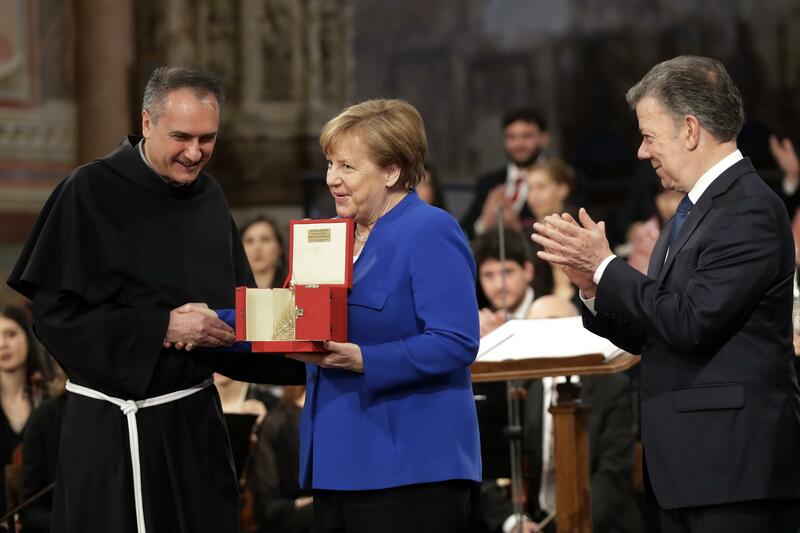 The German leader made her remarks at St. Francis’ Basilica, in Assisi, the saint’s hometown, where Franciscan friars awarded her the St. Francis Lamp for peace. Merkel was honored for the welcome Germany gave to Syrian war refugees, a decision that carried political risks for the chancellor and her party. Addressing conflicts on her own continent, Merkel decried what she called “nightly violations” in Ukraine of cease-fire agreements reached in 2014 and 2015 to end the conflict between pro-Kiev forces and pro-Russia fighters in the country’s battered east. “The harder the problem is, and the easier the solution is claimed to be, the more suspicious and critical everyone ….should be,” Merkel said. Even as she spoke, two Italian populist leaders, from the euroskeptic 5-Star Movement and the anti-migrant League, were meeting in Milan to try to hammer out a deal for a coalition government. Merkel stressed the importance of countering populist statements with facts and of speaking out when people make sweeping claims about entire sections of society. “I think we should try to do two things at once: be European, but also regard our home countries as part of our identity. They don’t have to be opposites,” she said. For her part, Merkel warned of the damage national stereotypes can pose for European understanding. She recalled how during the Eurozone crisis of the last decade, Greeks were branded as lazy in German media. Published: May 12, 2018, 9:42 a.m.